Every day children are inundated by endless messages in­tended to educate, entertain, or influence their behavior. It takes commitment and effort on the part of par­ents to monitor and help interpret these external influences on chil­dren. 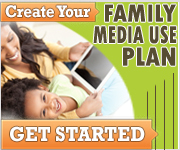 ​The American Academy of Pediatrics (AAP) encourages you to help your children develop healthy media use habits early on. Learn more here. Age-Appropriate Media: Can You Trust Movie and TV Ratings? Cell Phones: What's the Right Age to Start?